The route goes along the right part of the South-Eastern face. From the road near the alpinist camps under Forossky Kant move upwards and to the left firstly along the path, then by the slide-rocks (R0: 150 m, 20-30 0, б/к ). On the section R1-R2 go upwards by the steep slabs to the ledge with a big forked stump (R1-R2: 35 m, 70 0, -IV). On the section R2-R3 go to the left along the ledge to the base of the corner (there is a bolt under the corner) and then move by the corner with a tree in its middle. In spite of the short distance of this section, it is comfortably to make a belay on the top of the corner (there is a bolt), because the subsequent direction changes, it is difficult to extend the rope. (R2-R3: 20m, 70°, IV). On the section R3-R4 traverse to the left 12m and go upwards from the bolts by the slab to the direction of leaf-bearing tree. From the tree go upwards by the corner with a crack. In 20 m the crack ends with a cornice. Above the cornice there is a comfortable belay on the bolts. (R3-R4: 12 m , 60°, III 10 m , 80°, V 20 m, 85°, VI). On the section R4-R5 go upwards by the crack and the slab on the ledge under the overhanging wall (R4-R5: 45 m, 75°, IV+). On the section R5-R6 go upwards through the small overhang and then not long to the right by the crack system, sometimes filled with grass and soil. In the end of the section go through the break to the left on the ledge. (R5-R6: 25 m, 75°, IV+). On the section R6-R7 go to the right, then through “the boulge” in the base of the corner. The route goes along the right wall of the corner, constantly turning to the right, leads to the overhanging crack . (orientate by the bolts). (R6-R7: 40 m , 80°, V). On the section R7-R8 go along the crack difficult climbing 15 m upwards (AID is possible, there are bolts), then not long to the left by the crack and then by the walls, move on to the ledge under the black cornice. (R7-R8: 20 m, 95°, VI, A0 20 m, 80°, V+). On the section R8-R9 go upwards to the cornice and ascend it on the right side, reach the black wall – the corner and go along it to the grotto in 15 m from the lower plateau (R8-R9: 30 m, 85°, VI). On the last section go along the right edge of the grotto to the divided walls and move upwards to the plateau (R9-the summit: 20 m, 85 0, VI).. Length of the main part of the route is about 300 m.
Time is 3 – 5 hours. The new variant of the deion of the route was made by V. Pestrikov. Vladimir was the strongest alpinist of Dnepropetrovsk in recent years. He died in summer 2003 on the ascent to Hidden Peak (Gasherbrut I, 8068 m ) in Ukraine team, under the iceslide. This is one of the popular routes on Forossky Kant. There is a new variant of the deion of the route, made by A. Lavrinenko. On the section R1-R2 go upwards by the slabs to the inclined ledge with a big stump (R1-R2: 30 m, 65 0, IV). On the section R2-R3 go firstly to the right and upwards along the corner to the small tree (30m 65° I V). On the section R3-R4 go firstly by the slabs, then by the corner in the base of the break, leading to the big ledge (R3-R4: 50m 70° V). On the section R4-R5 go 10m upwards by the nail slabs, then move to the left to the corner. Then move upwards along the corner with nail walls to the narrow ledge (R4-R5 50 m, 80°, V+). On the section R6-R7go upwards along the corner on the ledge-balcony under the cornices (R6-R7: 30m, 90 0, VI А 2). On the last section of the route go firstly upwards through the first cornice, then by the vertical wall to the next one. Then go along the corner to the inclined ledge. From the ledge move by the easy corner to the plateau (R7-the summit: 30 m, 90 0, VI). From the ledge- balcony go to the left and upwards to the cornice, which is passed “head-on”. Then go along the abrupt wall to the big cornice, which is passed right to left (AID is possible). After the cornice а go upwards to the plateau (R7 – the summit: 30 m, 90 0, V, А 0). Length of the main part of the route is about 270 m.
Time is 4 – 5 hours. 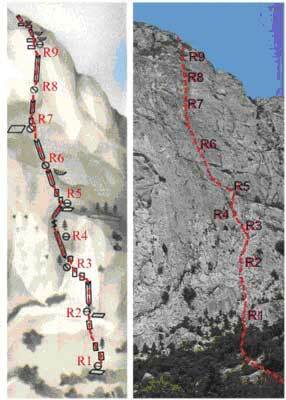 *) The difficult part of the route is equipped by permanent belay points. Petr Denisenko, one of the well-known alpinists of Dnepropetrovsk in 70s. He made many difficult first ascents in Crimea.